So far, this shift hasn't significantly affected farming and land use as the dryer conditions move across the US. 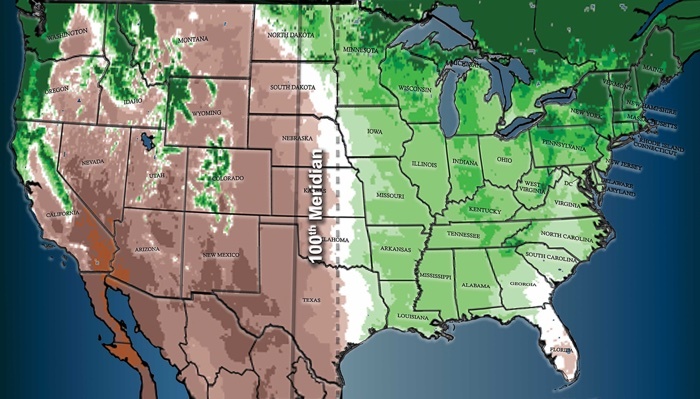 But the team's modelling suggests altered precipitation and rising temperatures as the century progresses will see the "effective 100th meridian" continue its shift eastward for decades to come, as arid conditions slowly colonise the east. "There will need to be a farm economy adjustment to this because of the environmental changes," Seager told Quartz. "The places over the western parts of the high plains will become more arid." "A farmer who was considering passing on her or his farm to their children over the next decade or two should be considering these kind of climate or environment changes," Seager told KUER. "There has to be some kind of adjustment. They can't just carry on doing exactly what they're doing right now because of this encroaching aridity. " "Passing from east to west across this belt a wonderful transformation is observed. On the east a luxuriant growth of grass is seen, and the gaudy flowers of the order Compositae make the prairie landscape beautiful," he wrote in 1890. "Passing westward, species after species of luxuriant grass and brilliant flowering plants disappear; the ground gradually becomes naked, with bunch grasses here and there; now and then a thorny cactus is seen, and the yucca plant thrusts out its sharp bayonets."